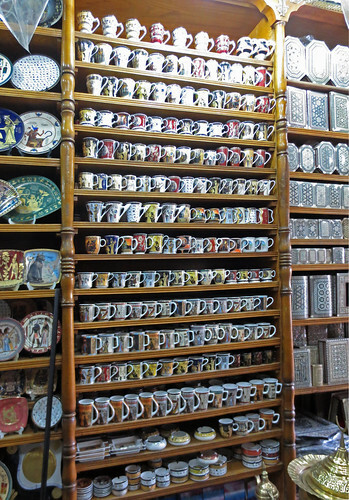 Yesterday, we were off to spend a day in and near Kahn el Khalili Bazzar, the greatest souvenir shop on earth. I'd show you a map, but then you could get out. 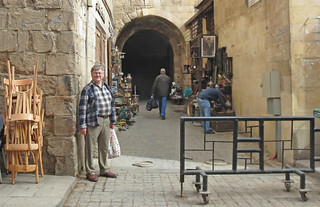 Suffice it to say that there are more shops, passages and alleyways than you will find in any carnival maze. This square marks the main entrance to the area. 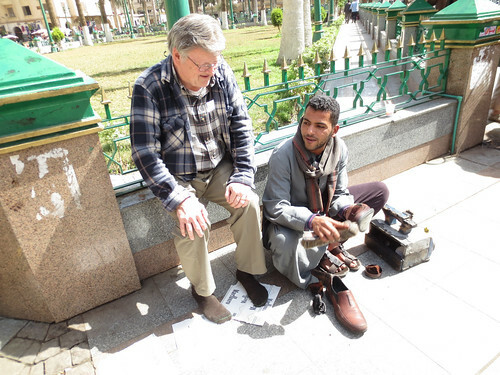 We always start off with a good shoeshine and somehow, no matter how we approach the area, our friend, Ali, will find us. He did a thorough job of cleaning several weeks dust from my shoes and restoring them to top condition. Look for him, he does a good job; he will be looking for you. We had a particular item in mind. I broke one of our Fathi Mahmoud coffee mugs and needed a replacement. This is now an older style and I needed a particular design in that style. Would I be able to find it? I spotted a few pieces of the right style in a shop. Soon we were in the third floor stockroom with our salesman totally devoted to the task. 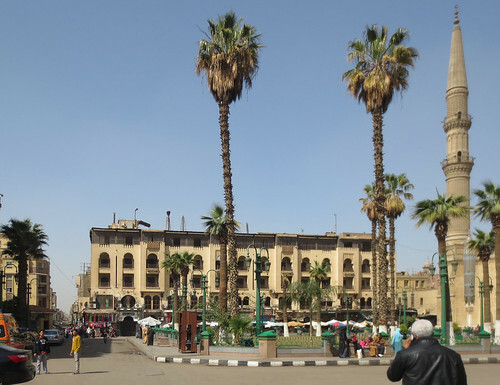 With a couple of other ritual stops out of the way, we were soon on the other side of the Khan and strolling down Al-Muizz street, described in some detail last year. 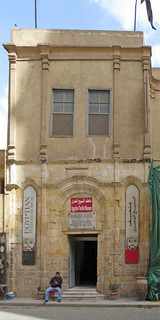 This time, we stopped to tour the Egyptian Textile Museum - Admission cost is 20 Egyptian pounds for foreigners, 2 pounds for locals. I wonder how that pricing scheme would go over in the States? 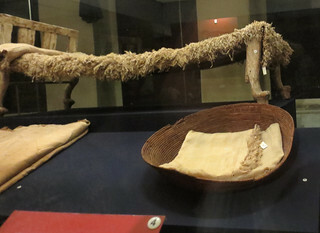 No photos are permitted so I only took this one on the left that shows what appears to be a fabric draped funerary bed similar to a gold one of King Tut in the National Museum. The museum has some interesting exhibits of very old fabric from ancient times and some from Greek and Roman times as well. It gets a definite thumbs up on Trip Advisor. 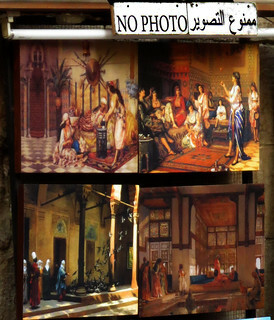 Elsewhere on Al-Muizz, we visited one of several antique shops in the area. I never have seen a collection of stuff quite like this. 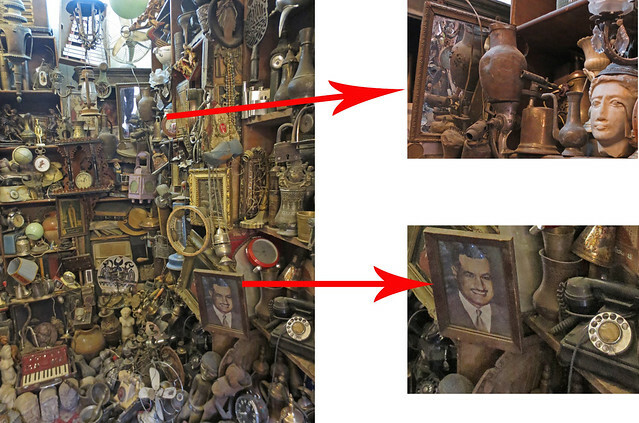 I was tempted by an old brass blowtorch, a picture of president(1956-70) Nasser and a telephone. 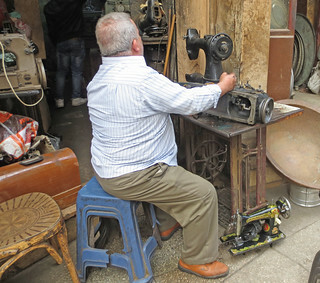 The street has an interesting collection of shops like this sewing machine repair shop. My father was in that business for a couple of years so I'm always interested in seeing the bottom side of a sewing machine. 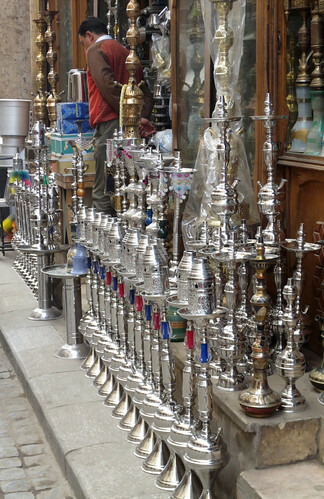 The water-pipes were lined up for sale and locals seemed more interested than others. 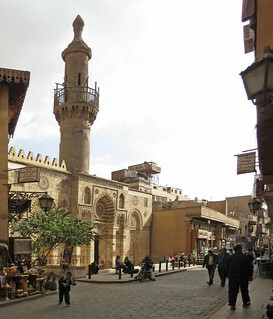 And there are several mosques on the street, of course. 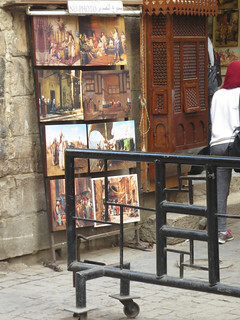 And by the time we had returned to the antique shop, an artist had hung his paintings out by the street. 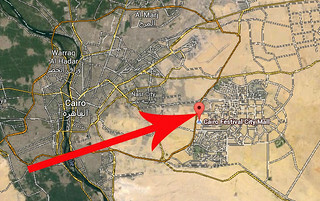 We spent two consecutive days over on the East side of Greater Cairo. 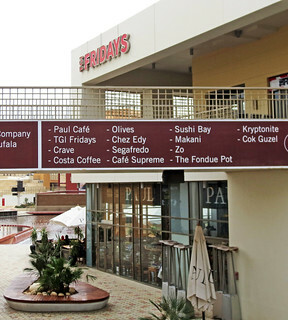 On Saturday we were taken out to lunch by a friend and ended up at the Cairo Festival City Mall. It is only about a fifteen mile drive from our area to the mall, but it is like entering a different century. 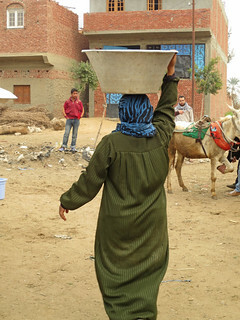 There are no donkeys on the street pulling carts of bottled gas, no ducks and chickens munching garbage, etc., etc. The neighborhood looks like a suburb in the southwest United States. The mall itself hosts the IKEA store that we visited last year. 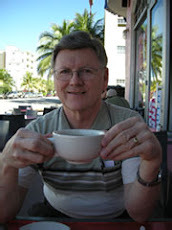 This year we were headed for the food court that surrounds the dancing fountain. 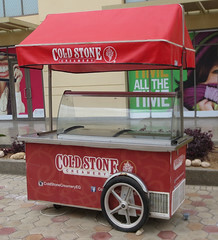 It was a bit too cold for the Cold Stone Creamery cart to be operating, but several restaurants near the water were serving at their outside seating areas. 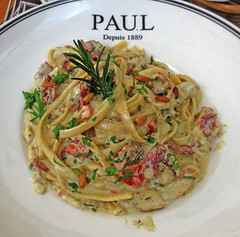 We chose Paul - since 1889 in France, more recently in the U.S. and Egypt. Many of the venues had familiar names and looked plausible if not familiar, although Kryptonite didn't sound like a winner to us. 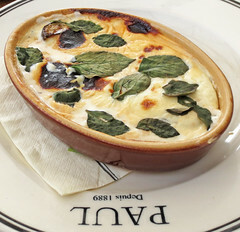 Linda had the eggplant and I ordered a pasta dish. The prosciutto, of course, like the bacon and pepperoni here, being a beef variety. 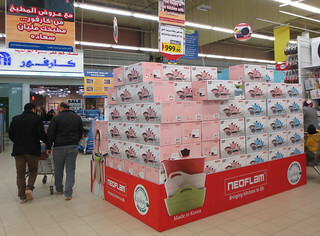 On Sunday we made one of our periodic outings to Carrefour in Maadi. 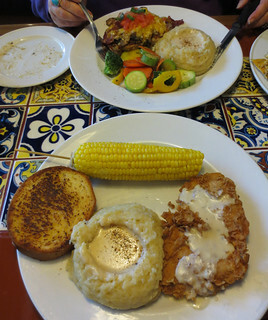 As usual we started with lunch at Chili's. I can't resist having the mashed potatoes and corn on the cob from time to time here. 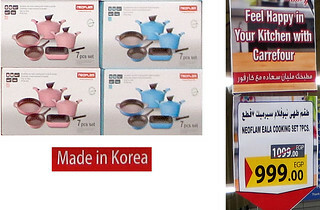 I regret to report that the anniversary sale at Carrefour with television specials has passed and the weekend special only featured Neoflam brand cookware. And it didn't seem to be inspiring many purchases. The colors appear to be influenced by some1950s bathroom tile and fixtures. 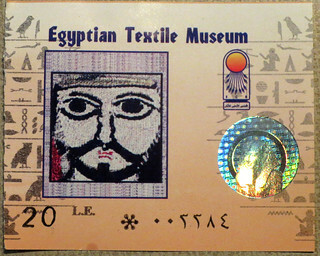 The price was 1000 Egyptian pounds (about $133) after a paltry 9% markdown. Something tells me a buyer in Paris is going to be looking for a new job soon. 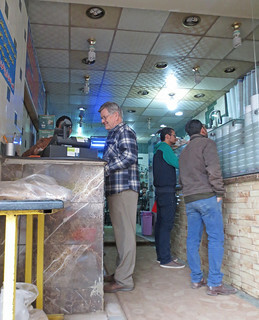 I couldn't help but reflect on the income gap between that side of town and here on the west side where we live when I popped into the local Koshary outlet down the block for a working-man's lunch. Here's the ordering scheme. 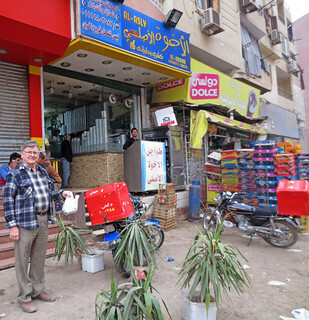 You pay 3 Egyptian pounds (42 cents) up front at the cashier's stand on the left and then get a ticket. Hand the ticket to the cook/bagger/server on the right side and he gives you all you need, as described back at this post. While I'm no longer a working man, I do love my koshary! To finish off my closet shelf project, I needed a bit more carpentry work. Our closet is decidedly not square and plumb, so I needed to cut a bit off of the sides of the large shelf. (It's about 26" x 32") When I raised it a few inches, the shelf moved into a narrower area. Of course, it is not a straight cut, as the right wall is gently curved. 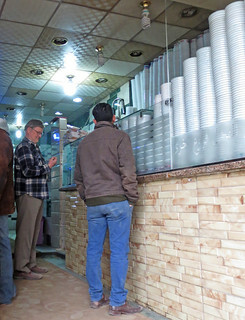 Last night we took the shelf over to Sammy (see original visit to his shop here) and discovered that he has a second, larger shop in a low-rent district not too far from our place. 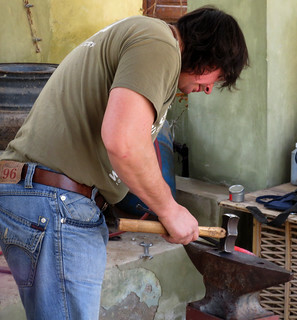 We met him there because he has a large band-saw and a molding-cutter/shaper at this shop. And an assistant! The assistant made our cuts after carefully measuring and scribing a line to indicate the half centimeter to be removed. He also cut me some 2x2 cm. height adjustment pieces. 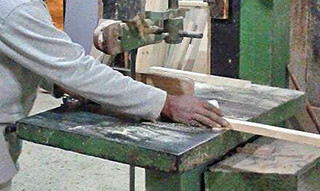 The tools have the green color that is associated with General Tools products that you find in the back pages of Fine Woodworking. But the brand name is likely on the blade and belt guards, wherever those might be. 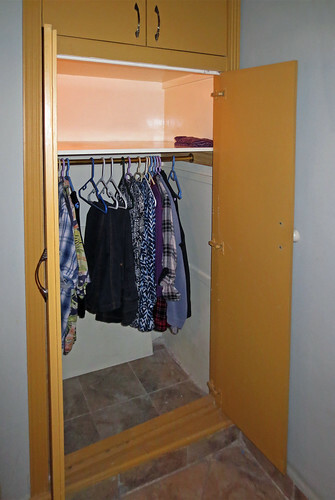 And now, Linda has her closet back, with a hanging rod and can organize it. She is very happy to finally have this fixed and was smiling as I took this last picture. 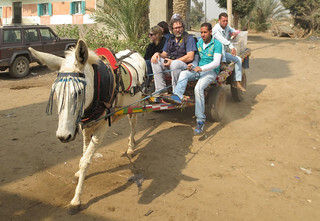 On our first visit to the horse farm in Abu Sir this year we met an Australian lady named Jill Barton who is running an equine aid charity in the vicinity. 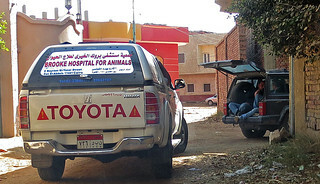 She mentioned a weekly veterinary clinic that is operated nearby by Canadian, Maryanne, in conjunction with the Brooke Hospital for Animals, a British project. 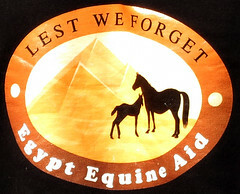 Follow those links and you will learn a good deal about the life of an Egyptian working animal. 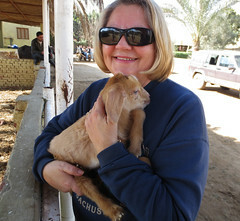 Jill had invited us to come out and join her on any Tuesday when veterinarians provide treatment for animals at local villages free of charge. This past Tuesday we headed out to join them. 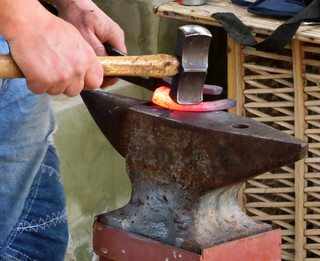 It turned out to be a good day to visit since a large group of Italian farriers happened to be in the area teaching their skills to Egyptian students of the trade. 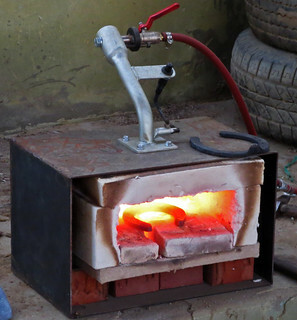 We caught up to the farriers at Maryanne's nearby farm where they were forging some new shoes. 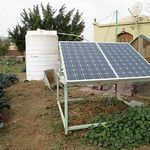 Maryanne's farm provides horseback riding for larger groups and she also has a small goat cheese operation along with organic vegetables irrigated by a solar pumping station. 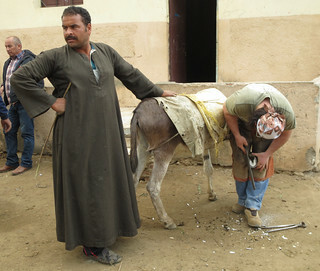 With a half dozen or so farriers and three veterinarians, we soon set off in a convoy to a nearby village. 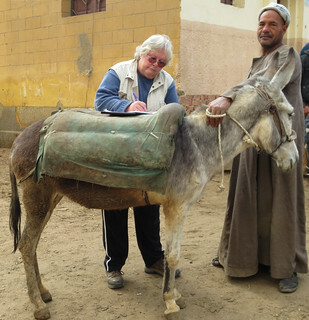 Maryanne has several of these small villages lined up on a rotating basis for the vets' Tuesday visits. 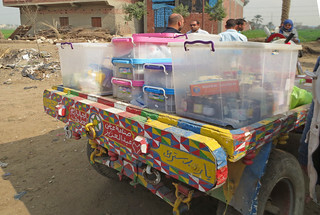 We arrived and they set up shop beside the local mosque. 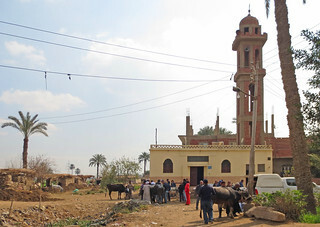 The mosque is the center of activity in the area. 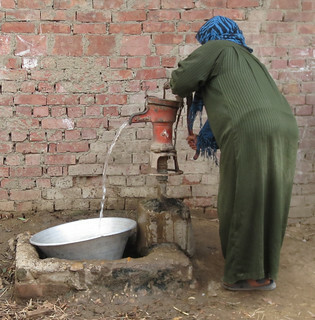 Women were coming to the pump to draw water. 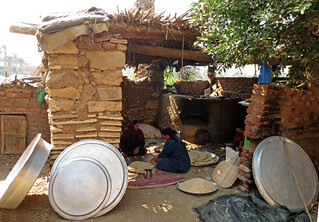 And bread was being prepared and baked in the oven just beyond the pump. 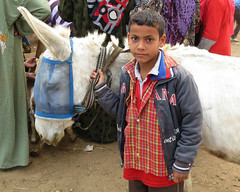 The vets' medical supplies took a slightly different route and arrived by donkey cart. 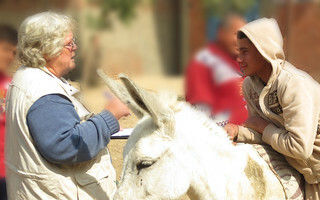 Maryanne keeps meticulous records on the animals and their treatment. 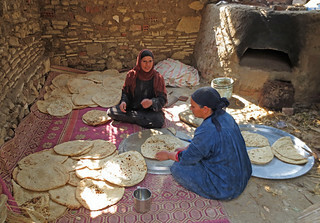 She has a very outgoing personality and appears to know a great many of the villagers. A young man had used the mosque loudspeaker system to announce that the clinic was in session and people began to arrive from all directions. 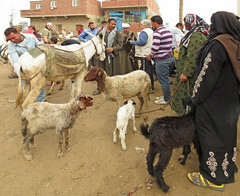 Villagers, young and old, brought a wide variety of animals with donkeys and horses being in the majority. The poultry owners were given a vitamin supplement that one of the vets later told me stimulated egg production as well as helping to develop thicker shells. 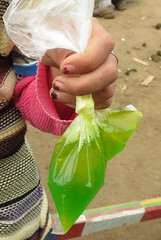 A number of infections were treated, too. 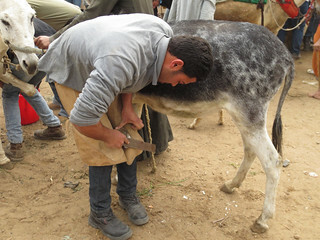 But much of the work this day was performed by the farriers. 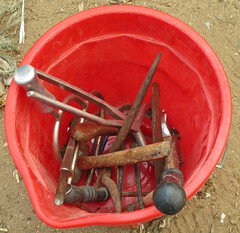 Each of them had a well-equipped bucket of tools. 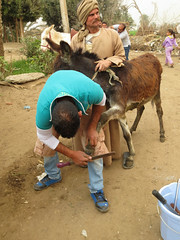 When the last of the animal had been treated, we returned to Maryanne's farm where she hosted a luncheon for the large contingent of volunteers and observers.